Gimignano and Monteriggioni. The hotel itself has the elegance and charm of the structure of the XVII century, refurbished by adding touches of contemporary art. In the hotel guests can enjoy the spa and the wine bar. Inaugurated in 1635 as a hospital, Palazzo San Lorenzo has been restored and enlarged several times: in 1638 with a new pharmacy, again in 1641 with a special permit; during 1950-70 with an internal enlargement and with the move to the chapel, rebuilt on the back side. It is today a charming palace, with modern furniture and a play of light that makes the atmosphere very warm and welcoming. Fusion of modern and classic style, the 48 rooms of Palazzo San Lorenzo are elegant and furnished with great attention to detail. Classic – have a surface of approx. 20 sq.m., with double bed or twin beds, overlooking the courtyard or the outside. Superior – have a surface of approx. 25 sq.m., with double bed or twin beds, features a bathroom with Whirlpool. Deluxe – have a surface of approx. 25 sq.m., bathroom with Whirlpool shower, overlooking the old part of the city. Junior Suites – have a surface of approx. 30 sq.m., with double bed or twin beds, features a bathroom with Whirlpool. Suites – have a surface of approx. 40 sq.m., with double bed or twin beds, features a bathroom with Whirlpool. An oasis of relax allows the guests to regenerate body and mind: the Spa of Palazzo San Lorenzo is reachable from the private lift (while external guests have access from the ancient pharmacy of the palace). Guests can pamper themselves with a comforting massage, sauna, Turkish bath, energising showers, heated pool with hydro massage function and a number of relaxing wellness paths. The treatments are made with natural products, that can also be find in the ancient Chemist, along with high quality cosmetics. The Spa is available to guests from 14 years old. Only a few hundred meters from Palazzo San Lorenzo is the Golf Club Abbadia, which offers courses made by professional staff of the Italian Federation of Golf. Guests can ask the reception for trekking and bike tours, horse riding in the nearby. The Restaurant Sopra Le Mura, open for dinner, is housed in the old chapel and is located in the rear of the building. A timeless atmosphere, the delicacies of Tuscan tradition and the perfect mix among ancient and modern: the guests have the chance to taste typical dishes such as the Ribollita, the pappa al pomodoro and the bistecca alla fiorentina. The staff is at disposal to help guests choose from a great selection of wines, particularly furnished with the popular local labels. The restaurant closes one day per week (usually on Tuesday). The ground floor of the palace hosts the Wine Bar, where the guests of Palazzo San Lorenzo can have breakfast or relax sipping a good wine or a tasty cocktail. Tradition, design and innovation meet at the wine bar, where the shining effect of the crystal (that made the village of Colle Val d’Elsa popular all over the world) plays an important role. The staff of the hotel will be glad to organise cooking classes, excursions in Vespa, shopping tours, tours at the discovery of the Wine Routes and tastings, city tours for their guests. Tourist tax is € 2,00 per person/overnight (to be paid on spot at the check-out) for a maximum of 5 overnights and valid for everyone above 12 years. The tax applies from March to October. Twin rooms, soundproof, furnished in a modern style. Soundproof walls, bathroom with shower and view towards the outside or bathroom with tub and view over the courtyard. They can accommodate up to 2 adults and 1 infant. Wi-Fi internet connection free of charge. Bright and modern double or twin rooms with parquet floor, writing desk, bathroom with Whirlpool, soundproof walls. They overlook the old part of the city. They can accommodate up to 2 adults and 1 infant. Bright and modern double or twin rooms with parquet floor, writing desk, , soundproof walls, bathroom with Whirlpool shower. They overlook the old part of the city. They can accommodate up to 2 adults and 1 infant. Bright and modern double or twin rooms with parquet floor, sofa bed or two armchairs, writing desk; soundproof walls. The bathroom features a shower bathtub with hydro massage. Wellness path with sauna, energising shower, heated swimming pool and Hammam. Tea and coffee facilities. They can accommodate up to 2 adults, 1 child and 1 infant. 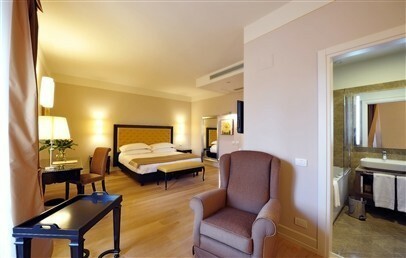 Bright and modern double or twin rooms with parquet floor, sofa bed in the living area, writing desk; soundproof walls. The bathroom features a shower bathtub with hydro massage. Wellness path with sauna, energising shower, heated swimming pool and Hammam. Tea and coffee facilities. They can accommodate up to 2 adults, 1 child and 1 infant. Free Spa Access included in the price, upon reservation.